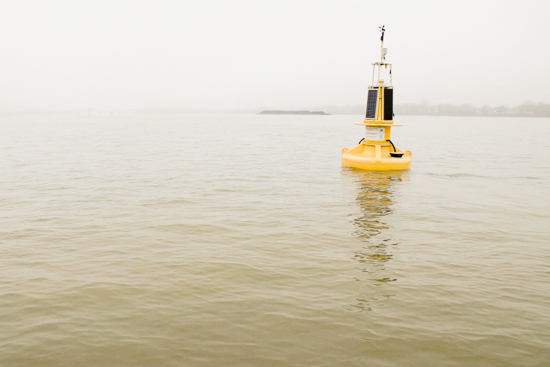 Cities in the bay watershed use the natural environment to clean stormwater on-site. The mention of Lancaster, Pennsylvania evokes images of cows trampling through streams, laundry hanging on the line, whoopie pies, and an agricultural way of life that has been forgotten in most places of the Chesapeake Bay watershed. While tourists flock to the southeastern Pennsylvania county popularly known as "Pennsylvania Dutch Country," the City of Lancaster may soon hold its own claim to fame as a green urban center. Vegetation overflows from rooftops, follows sidewalks, and decorates parking lots that were once neighborhood eyesores: this is how city officials envision Lancaster twenty-five years from now. 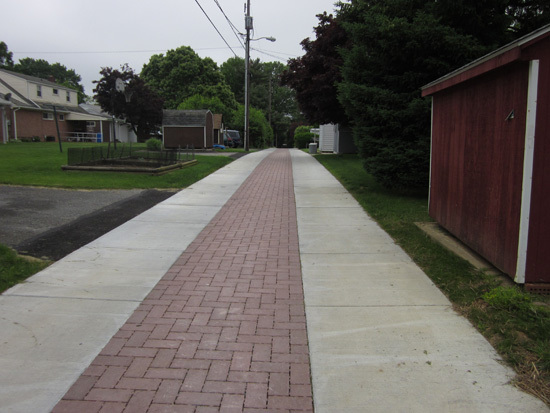 These greening projects, the first of which began construction this year, not only give red brick-clad Lancaster a sharp, aesthetically pleasing color contrast; they are part of the city’s twenty-five year plan to prevent its 750 million gallons of annual stormwater runoff from entering the Conestoga River, an impaired Susquehanna River tributary. While stormwater runoff may appear to be “just rainwater,” as it moves through parking lots, lawns, and roadways, it picks up pollutants. These pollutants and the water that carries them are often not treated or filtered before being conveyed into local tributaries. But in Lancaster, tree trenches along parking lots absorb stormwater; rain gardens are filled with plants that are able to absorb a large amount of water at a time. Such vegetation allows the stormwater to seep slowly into the ground before running off onto roadways, parking lots, and other “impervious” surfaces. These “hard” surfaces make it easy for water to pick up automobile chemicals, pet waste, litter, and other pollutants on its way into local storm drains and tributaries. In places where vegetation cannot thrive, like parking lots and alleyways, concrete and asphalt are replaced by permeable pavement. This type of pavement allows water to pass through into the ground, instead of acting as a seal and forcing water to form puddles or run off into the storm drains. "The ground will naturally absorb the sediments, the phosphorus, and the nitrogen," explains Charlotte Katzenmoyer, Director of Public Works for the City of Lancaster. "The bacteria in the soil will use this for their feeding purposes. You're actually using the ground to clean that stormwater." Using what is already there is saving Lancaster money – lots of money. With enough vegetation and permeable pavement, Lancaster will be able to keep its stormwater on site and use the natural environment to clean it. And it will do so for less than half the amount of money it would take to manage stormwater with man-made systems. It would work, but it would be expensive. "When the Environmental Protection Agency started coming to us, and asking us when we were going to build these storage tanks, that's when we took another look,” says Katzenmoyer. “We asked if we could more cost effectively achieve the same goals with green infrastructure." "Green infrastructure" keeps stormwater onsite using natural processes and nature-inspired technologies. Plants in rain gardens and tree trenches absorb stormwater quickly in heavy rain events, preventing it from running off into storm drains. Permeable pavement, although not natural, imitates this characteristic, and allows water to infiltrate into the ground. Lancaster's new, green infrastructure plan cut their costs dramatically; the city is able to manage its 750 million gallons of storm water per year for less than 140 million dollars total. This was less than half the amount of money required just to build the underground storage tank. 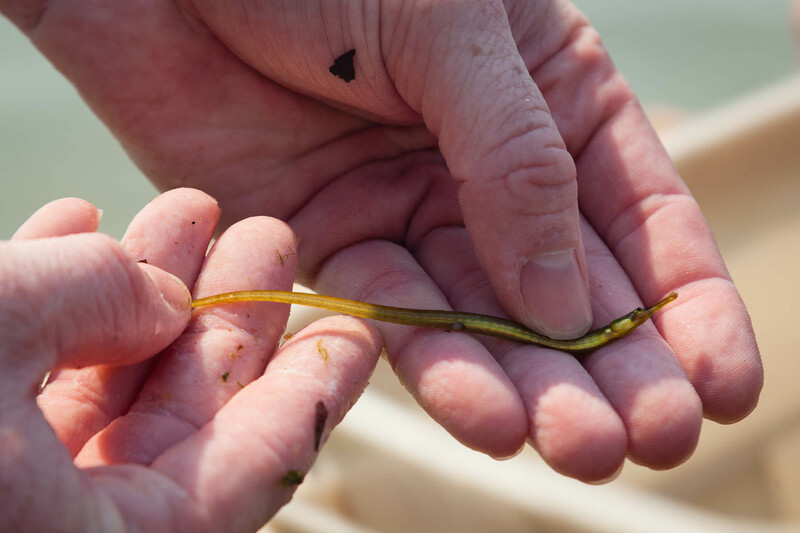 Lancaster's green infrastructure plan was born out of the Environmental Protection Agency's request that all municipalities in the Chesapeake Bay watershed detail how they plan to reduce pollution in their local Chesapeake Bay tributaries. "As much as we are motivated to restore the natural environment and do the right thing, ultimately, this is something that the federal government, the Environmental Protection Agency, is telling us we need to address," explains Fritz Schroeder, Director of the Lancaster-based non-profit Live Green, which has been working with the City of Lancaster to educate the community on clean water issues. "The city, with great vision and foresight, I believe, is choosing to do it in a very creative fashion, utilizing green infrastructure instead of a traditional grey infrastructure piping system,” says Schroeder. “This will help set our community apart and serve as a platform for creating a wonderful place for us to call home for years to come." While this stormwater management technique imitates the way the natural world manages stormwater, it is a revolutionary concept for city planners. Most cities were built to get stormwater off site as quickly as possible, hence the storm drains that convey water into local tributaries. These stormwater systems flood in severe rain events, carrying pollutants such as automobile exhaust, bacteria from pet waste, and lawn fertilizer, directly into our rivers at high speeds. When water moves at high speeds, it often takes dirt from stream banks with it. This sediment pollution clouds the water and makes it difficult for bay grasses and other life to flourish. In the last few years, more and more cities across the bay watershed, including Edmonston and Bladensburg, Maryland, and Richmond, Virginia, have begun to embrace green infrastructure strategies. No matter which way the stormwater flows through Lancaster’s public parking lots, it will be absorbed by a garden, tree, or permeable pavement. “The idea is that as all the stormwater comes from uphill, moving through the parking lot, one technology or another will capture the water, and then infiltrate it back into the natural environment,” explains Schroeder. While tree trenches and rain gardens capture stormwater, shaded parking lots also reduce the heat island effect, the concept that large, developed areas heat up quickly and increase the temperature of surrounding, undeveloped areas. A reduced heat island effect reduces air conditioning costs in the summer and improves air quality. 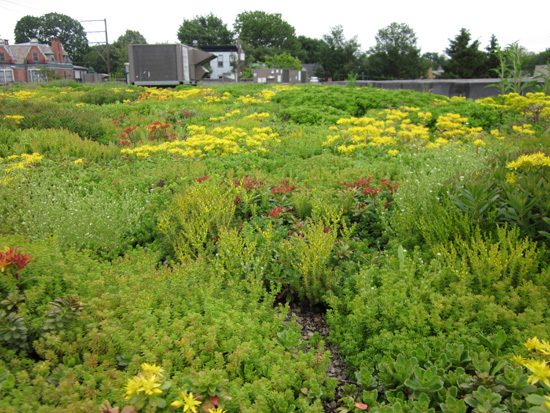 A green roof, constructed on Graff Family Funeral Home as a project of Lancaster County Planning Commission, reduces the heat island effect on the formerly black rubber roof and has cut the building's air conditioning costs. "Traditionally on a black rubber roof like this, you will have temperatures that are 60 to 70 degrees hotter in the summer," explains Schroeder. The plants also absorb stormwater falling on the roof, reducing the amount that flows into the city's combined sewer system. 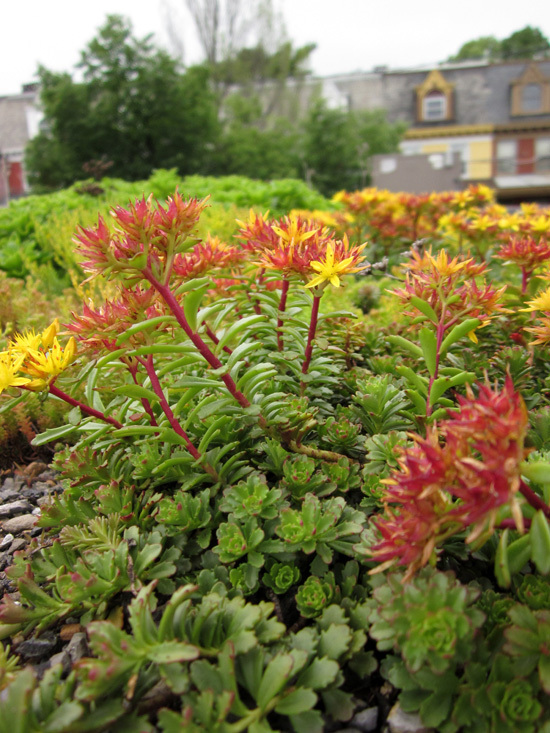 "As (the sedums) continue to fill in and cover all the bare spots of this roof, the roots will spread and serve as a sponge that takes up this water," says Schroeder. "We believe we're capturing and retaining between 50 and 70 percent of the rain flow that falls on the roof." Other technologies include colorfully painted rain barrels that capture rain coming off of roofs, as well as disconnected downspouts that direct stormwater into rain gardens. With a green infrastructure approach, all of these nature-inspired technologies work together to absorb stormwater, preventing it, and the pollutants it carries, from entering local tributaries. While Lancaster is completing 100 stormwater management projects in 2012, all are on city-owned properties. In order for stormwater flows to be reduced, private property owners also need to consider installing rain gardens and rain barrels. The City of Lancaster works with Live Green, a non-profit whose “Save It” campaign encourages residents to install rain gardens, disconnect their downspouts, and conserve water in their homes. The organization has distributed over 500 rain barrels in the last five years, held multiple stormwater workshops, and distributed native trees. Cities that have implemented green infrastructure projects have similar residential “greening” programs. In the Washington D.C. area, RiverSmart Homes offers incentives to residents who reduce runoff from their properties. In Richmond, Va., Greening Virginia’s Capitol walks residents through installing rain barrels and rain gardens. But these green technologies don’t just improve the water quality in the Little Conestoga and Conestoga Rivers, they improve the quality of life. Increased public green space fosters a sense of stewardship for the natural world, and colorful rain gardens increase property values. “There's a lot of data and research about the impacts on crime, the impacts on property value, the impacts on retail sales, all from implementing a program like this. But it’s just something that feels good,” says Schroeder. For more information on why stormwater runoff is harmful to the Chesapeake Bay, and to learn how to reduce the amount of runoff from your property, see our How To’s and Tips. For a more thorough look at stormwater runoff in Lancaster, check out this video from Save It Lancaster. 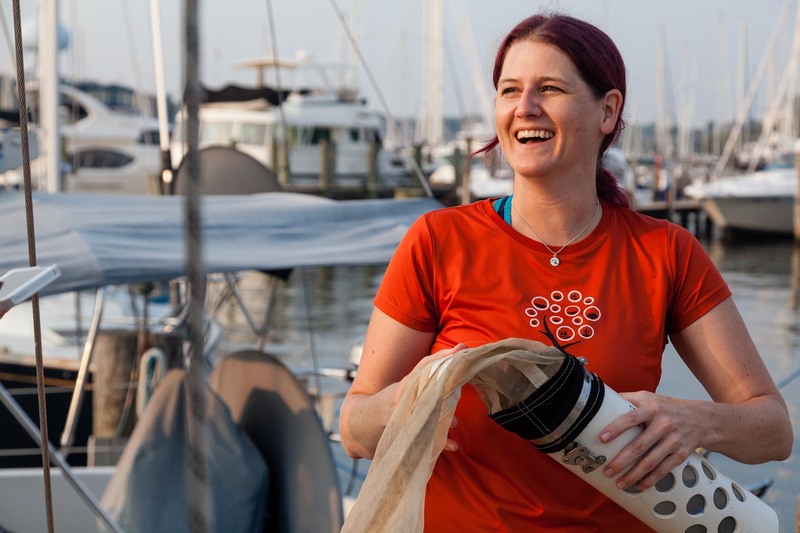 About Caitlin Finnerty - Caitlin Finnerty is the Communications Staffer at the Chesapeake Research Consortium and Chesapeake Bay Program. Caitlin grew up digging for dinosaur bones and making mud pies in Harrisburg, Pa. Her fine arts degree landed her environmental field work jobs everywhere from Oregon to Maryland. Now settled in Baltimore, she is eagerly expecting her first child while creating an urban garden oasis on her cement patio.